Taco Bell for me. Two Soft Taco Supremes and a Steak Gordita. Sorry no photos. Anorexics like me need to keep our figure, so no lunch for me today. Dinner will probably be wherever my 4 year old decides to take me. Faster isn`t better. BETTER is better no matter how long it takes. 5 Guys rules! They just opened one up near me. If I ate that Iwould instantly gain 2 pounds. I had a 6 inch Wawa Italian hoagie on Whole wheat. Watching the gut if you know what I mean. Down to a 32` waist. Gotta look good for the girlies now that I`m single. 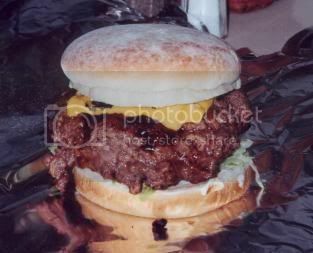 That 5 Guys burger reminds me of my famous `Guido Burger`. This burger reminds you that EVERYTHING is bigger in Texas. Even the backyard barbecue burgers. Sweet burger! I can`t imaging trying to eat that. It`s looks like it`s 1-1/2" thick. Crazy! We don`t have a 5 Guys around here but I looked and there is one in Madison, about 3 hours away. Maybe next time I am there I will try it. Gotta look good for the girlies now that I`m single. I haven`t eaten yet! Maybe I`ll fix me a protein smoothie. "I`m staying out of it." Rice, chicken and veggie bowl for me. Jngrbrdman will probably be the only one that recognizes the place I got it. It`s a Utah thing called Hoggie Yoggie. It`s kind of like the Chick Fillet though instead of Evangelical Christians heading it up Latter-Day Saints (Mormons) kicked this one off. They do hoggies, rice bowls and frozen yogurt. It`s a franchise that doesn`t take a lot of money to get started in and it`s fairly popular as a regional thing. I must say that today it was truly terrible, neither my wife or myself were able to finish it. That`s right Steve you got it. The bachelor pad is where it`s at for me! Leftover meatloaf, twice baked potato, and salad for lunch. Chicken fajitas and salad for dinner. I had 1 cup of brown rice, 1/2 cup of black beans, and a 2 chicken breast for dinner. I`m in bliss right now. Joe, send one of those my way. I`m a transplanted Chicagoan and we have the world`s worst pizza in California.